Winter is a very tough time of the year, with biting cold and extreme weather events. While there are a variety of preparations you need to make before the winter season, one of the most important is getting your car ready for the steep drop in temperature. 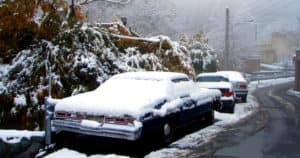 Here are a few cold weather car care tips that should help your vehicle make it through the winter season without serious damage. One of the first things that you need to do to winterize your car is to check your tires. Cold temperatures can cause a loss of tire pressure, and having under inflated tires can make driving on slick winter roads very risky. Reference your owner’s manual or the label on your tire to find the correct PSI, and then check your tires daily to make sure that they are properly inflated. It’s also important to consider whether or not you should add snow tires to your car. While snow tires may not be a necessity if you live in a city with snow plow service, they can be crucial if you live in a secluded area. Think about how much snow you may encounter this winter season, and you should be able to decide if adding snow tires to your car is the right choice. After you’ve made sure that your tires are ready for the winter, it’s time to start thinking about the various fluids in your car. The different fluids in your vehicle are very vulnerable to extreme temperatures, and if you neglect to adjust them before the weather turns frigid, the longevity of your automobile may be at risk. The coolant in your car is the first and most important fluid to check before winter. If you don’t have the right mixture of water and antifreeze, it’s possible that the liquid in your radiator will freeze, causing untold damage to your vehicle. While you can test your coolant level yourself with a tester, it’s a better idea to have this examined by a dealership professional. While your coolant is being checked, you should ask your maintenance professional about switching to a thinner engine oil, which can help your vehicle perform better in sub-freezing temperatures. Lastly, you should add wiper fluid to your car that is resistant to freezing temperatures. Standard wiper fluid may ice up when temperatures drop below freezing. The final step in getting your car ready for winter is packing an emergency kit. Break downs can be very dangerous in the winter months, so you must be prepared for every possibility. First, pack some warm weather clothes and blankets so you can stay warm. Second, add a first aid kit with items that can treat burns, cuts, and other types of injury. Third, keep a cell phone battery pack and a kit for charging a dead car battery. Finally, you should pack items such as gravel or kitty litter that can help you regain traction on slippery roads. Follow these tips to winterize your car so that you can be ready for the year’s coldest season.